3DViewStation Desktop KISTERS is a data visualization and collaboration tool, is aimed at all users of manufacturing companies. The data comes from 3D CAD in connection to be transposed and viewed. With 3DViewStation you can check very quickly the data of the virtual model of the product and lets you analyze them. It include measuring tools, analysis and markup features in collaborative purpose. 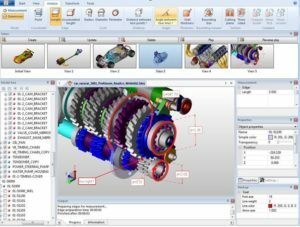 They are supported file formats of all major CAD systems such as CATIA, NX, ProE / Creo. Further details are available on 3DViewstation, official youtube channel by manufacturer.